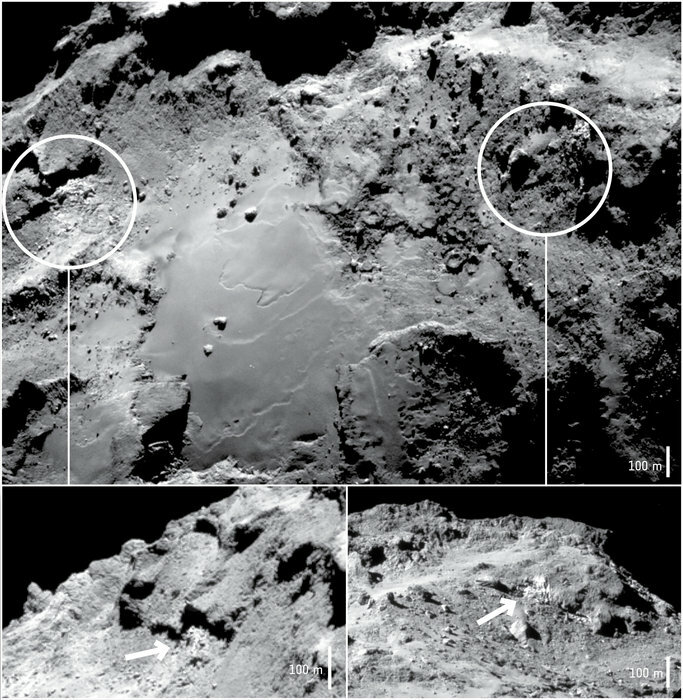 January 13, 2016 – Observations made shortly after Rosetta’s arrival at its target comet in 2014 have provided definitive confirmation of the presence of water ice. Although water vapor is the main gas seen flowing from comet 67P/Churyumov–Gerasimenko, the great majority of ice is believed to come from under the comet’s crust, and very few examples of exposed water ice have been found on the surface. 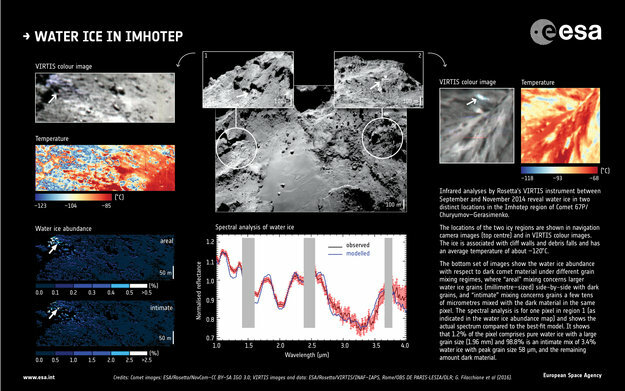 However, a detailed analysis by Rosetta’s VIRTIS infrared instrument reveals the composition of the comet’s topmost layer: it is primarily coated in a dark, dry and organic-rich material but with a small amount of water ice mixed in. The ice is associated with cliff walls and debris falls, and was at an average temperature of about –120ºC at the time. In those regions, pure water ice was found to occupy around 5% of each pixel sampling area, with the rest made up of the dark, dry material. The abundance of ice was calculated by comparing Rosetta’s VIRTIS infrared measurements to models that consider how ice grains of different sizes might be mixed together in one pixel.